City Theatrical’s new Multiverse® SHoW Baby™ is a wireless DMX transceiver that delivers breakthrough plug and play wireless DMX and RDM transmission. In its default mode,it works like all other SHoW Baby Transceivers with six user selectable SHoW IDs. By connecting an RDM controller, like DMXcat® Multi Function Test Tool, all of the revolutionary new 2.4GHz Multiverse SHoW IDs are accessible. 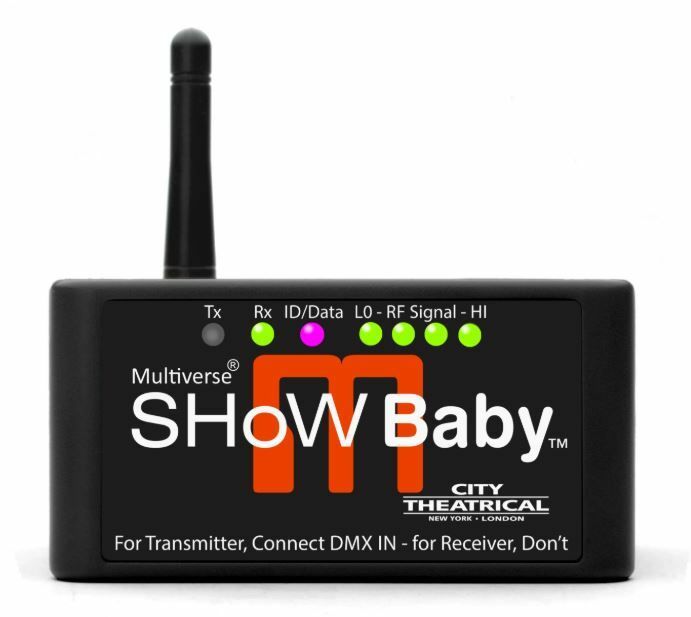 Users can add to their existing SHoW DMX SHoW Baby® systems, build new single universe Multiverse systems, or use Multiverse SHoW Baby as a receiver on multiple universe systems with a Multiverse Transmitter.